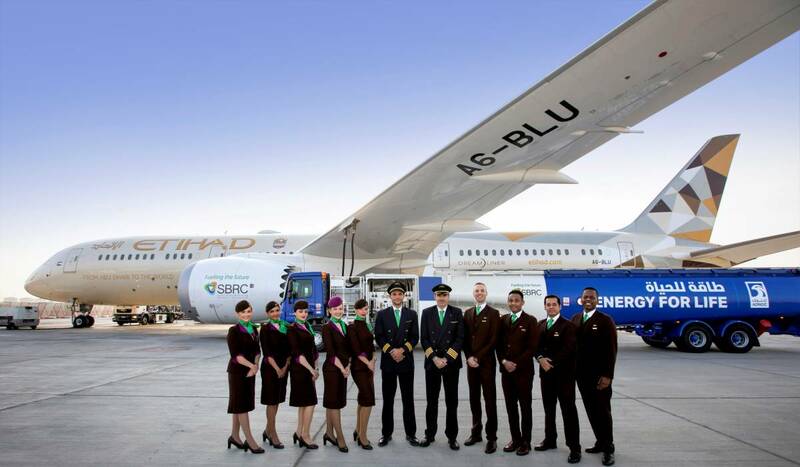 ABU DHABI, United Arab Emirates (UAE) — The Sustainable Bioenergy Research Consortium (SBRC), a non-profit entity established by Masdar Institute that is part of Khalifa University of Science and Technology, on January 17, 2019 announced the world’s first commercial flight using locally produced sustainable fuel on an Etihad Airways Boeing 787 powered by GE’s GEnx-1B engines. His Excellency Dr Thani bin Ahmed Al Zeyoudi, Minister of Climate Change and Environment, said: “The UAE’s visionary leadership is strongly committed to positioning the country as a global hub for innovation and sustainability. In this context, productive cross-disciplinary public/private partnerships are crucial to fuelling research and development efforts and creating game changing innovations that enable a more sustainable future. Dr Al Hammadi added: “As a leading research institution in the region focused on providing cutting edge technologies in clean energy, Masdar Institute at Khalifa University remains committed to continue with its mandate to produce biofuel, clean energy, and sustainable technologies for reducing carbon emissions, as well as water and environment-related research.” Using sustainable feedstock to produce the fuel significantly reduces life-cycle carbon dioxide emissions compared to fossil fuel. The biofuel is blended directly with jet fuel and does not require any modifications to aircraft, engines or airport fuelling delivery systems. The unique initiative also bolsters the oil and gas industry by using existing refining infrastructure, with the potential to become an important new option for sustainable aviation fuel in the future. ADNOC Refining has played a fundamental role, providing the expertise and infrastructure to ensure the effective refining of the seed oil to meet stringent jet fuel standards. ADNOC Distribution has also provided an essential element of the project through the blending and delivery of the biofuel to the aircraft. Jasem Al Sayegh, Chief Executive Officer ADNOC Refining, said: "We are proud of the role that ADNOC Refining is playing in carrying out this research for the SBRC pilot project. Today represents a significant step forward on the journey towards finding a final solution for commercial-scale aviation biofuel.” Approximately 160,000 passenger flights have flown on a blend of sustainable and traditional jet fuel since the first biofuels were certified for commercial use in 2011. Sustainable aviation fuel represents a significant opportunity to help aviation meet its goals to cap the growth of carbon emissions by 2020 and cut levels to half of what they were in 2005 by 2050.